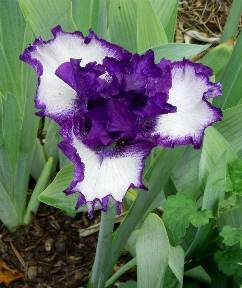 This family is the largest and most developed of any of the bearded and aril irises. 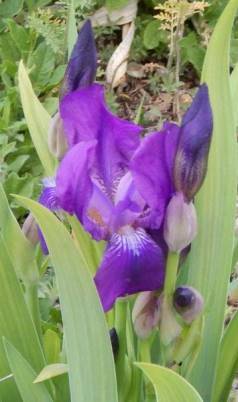 It includes the immensely popular modern tall bearded iris, as well as border bearded irises and some MTBs and IBs. 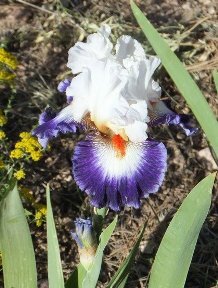 Originally, the tall bearded irises grown in Europe were diploids with 24 chromosomes, mostly hybrids of Iris pallida and I. variegata. 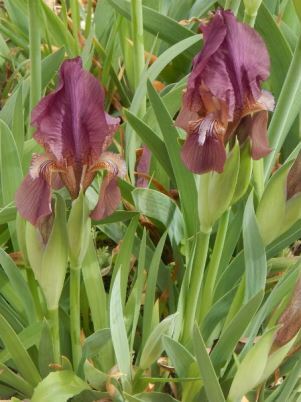 In the early decades of the 20th century, breeders combined these diploid varieties with tetraploid species from the eastern Mediterranean. The result was the eventual conversion of the diploid tall beardeds to tetraploids. 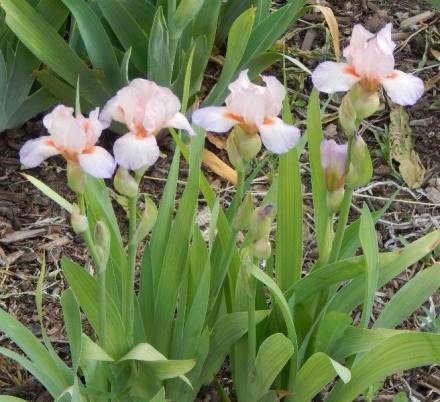 All the original color patterns were present in the new tetraploids, and novel patterns emerged as well: the tangerine bearded pinks, the luminatas, the dominant bicolors. 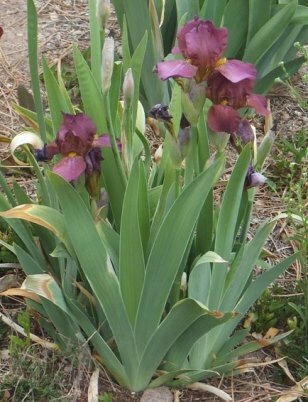 The tetraploid plants were thus not only larger and more dramatic, but more varied as well. 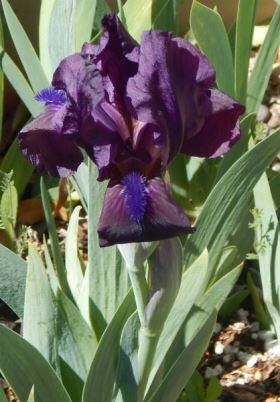 The creation of the modern tall beardeds also paved the way for the fertile families of medians (standard dwarf bearded) and arilbreds (C. G. White type halfbreds). The dwarf species I. reichenbachii has both diploid and tetraploid forms (the latter often identified as I. balkana), and the tetraploids belong to this family, as does the copiously branched median species I. aphylla. These species thus have the potential of extending the fertile family of the TBs and BBs to include smaller medians and even dwarfs. I. aphylla is in the background of the black and dark violet TBs from Schreiner and Cook lines. 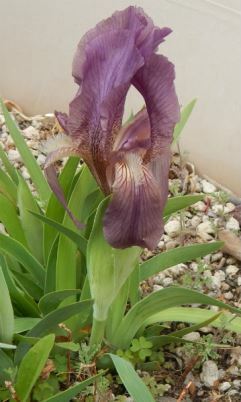 I. reichenbachii was used by Paul Cook to produce the intermediate 'Progenitor', which introduced the dominant bicolor pattern into the TBs, resulting in the modern amoenas, variegatas, and neglectas. 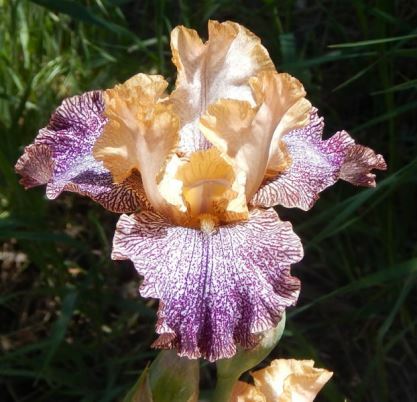 Similarly, Joseph Ghio used I. balkana to breed some subtly colored bitones and bicolors. 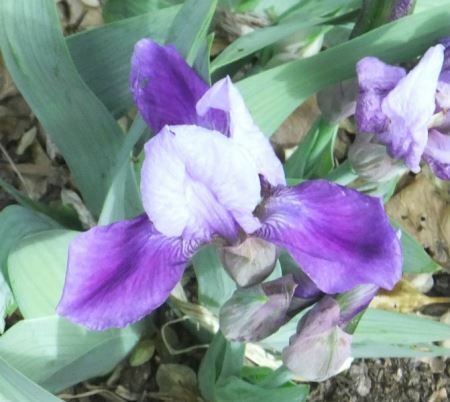 In these cases, bringing the novel color pattern into the TBs was the objective, not breeding smaller tetraploids. The latter goal was taken up by Ben Hager, who used I. aphylla to create a line of tetraploid MTBs. 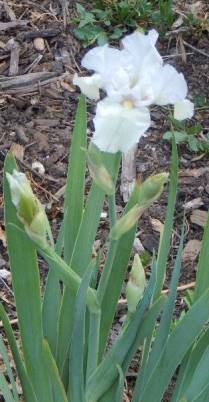 (Most MTBs are diploid, descendants of the original diploid TBs.) 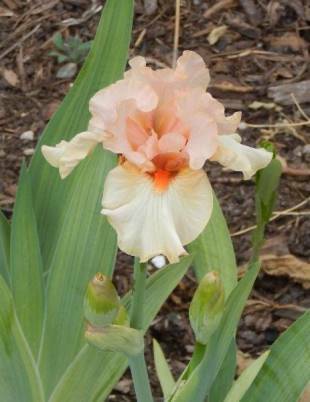 He was thus able to bring some of the color patterns of the tetraploids (notably tangerine pink) into the MTB class. 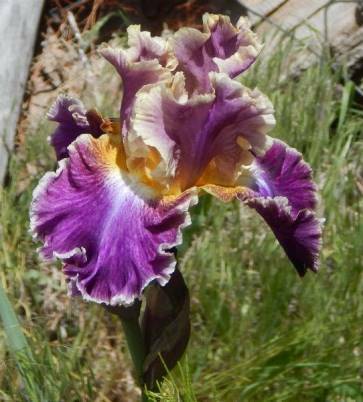 This work was continued by Jim and Vicki Craig, who produced increasingly lovely tetraploid MTBs, IBs, and BBs, and even two tetraploid SDBs, 'Arrival' and 'Slick Trick'. 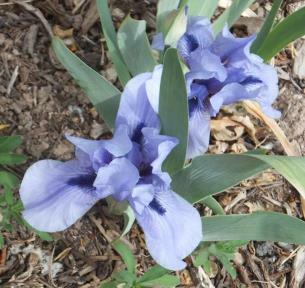 The aphylla-based median lines now have established their place among garden irises. 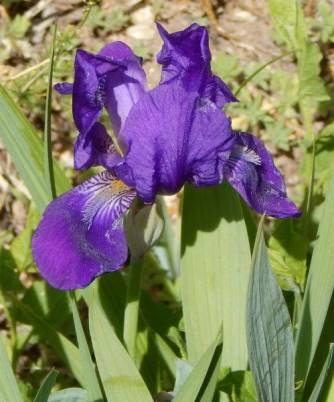 Presently, I. aphylla features in Paul Black's work with small-flowered TBs and nontraditional median types. What more remains to be done, aside from the continual quest for new and improved varieties? The main area where I see room for expansion in this family is in its smallest members. The potential of I. reichenbachii / I. balkana to produce SDBs or even MDBs that are fully fertile with modern TBs and BBs has not yet been tapped. 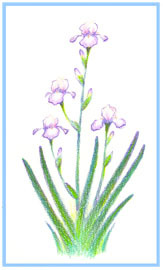 Unfortunately, the known tetraploid forms (such as the clone Balkana Darby) have become very difficult to locate. 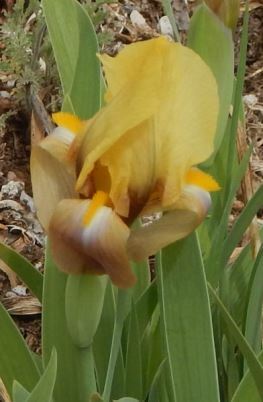 The yellow I. reichenbachii is somewhat more available both as plants and as seed, and some plants may be tetraploid. 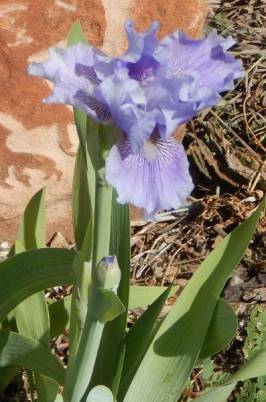 I have made it a priority to find and preserve a tetraploid form of this species. (See my notes on I. sp. aff. reichenbachii ex Vardar Gorge, Macedonia.) 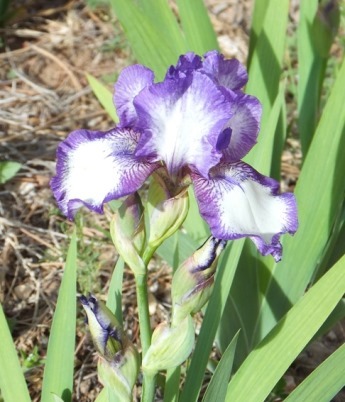 In the meantime, it is possible that crossing the diploid forms - as well as other 24-chromosome diploids such as I. suaveolens (mellita) - with tetraploids might produce a tetraploid seedling or two from an unreduced gamete. 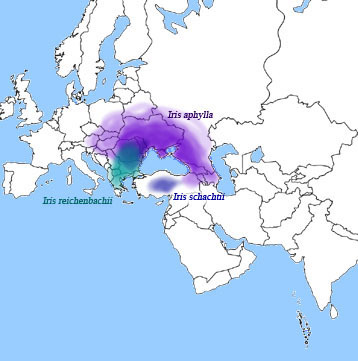 The small Turkish species I. schachtii is also a 48-chromosome tetraploid and will be useful for breeding in this family. The somewhat larger species Ii. junonia and purpureobractea may also be of value. 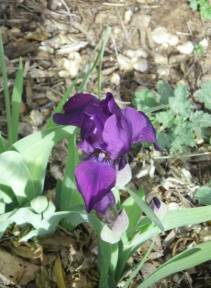 I've compiled a listing of 48-chromosome medians that may be of use in building a collection of these irises. 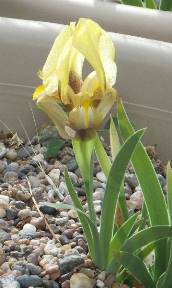 I've bloomed I. schachtii in several different years, but never got any successful crosses with it, due to its habit of timing its bloom to coincide with freezes, snow, and hail storms. 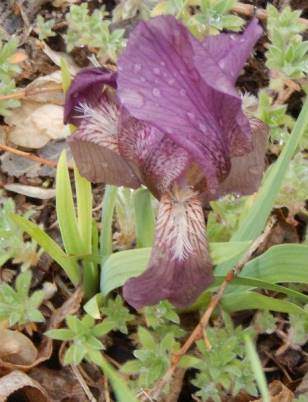 Of much more promise so far is a form of I. reichenbachii from Mt. 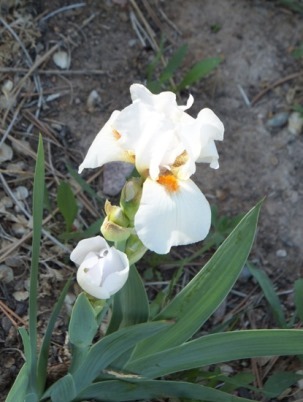 Vikos, Greece, which I obtained some years ago from Odyssey Bulbs. 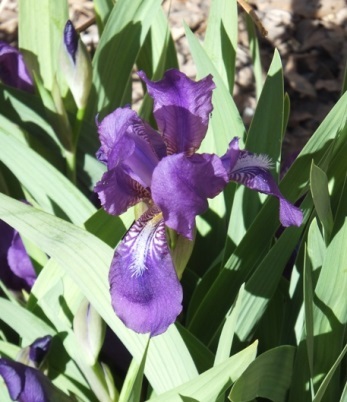 Its pollen has proven readily compatible with tetraploids, including I. aphylla, BBs, and tetraploid MTBs and SPEC-X types from aphylla breeding. Such compatibility does not conclusively establish its tetraploidy, but it is very suggestive. 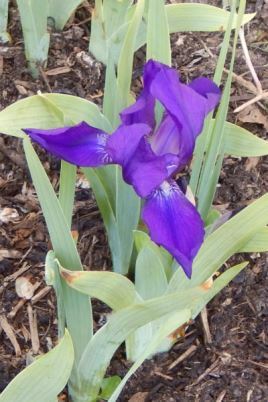 I now have seedlings from the first of these crosses, and should see bloom in 2019 at the latest. The fertility of these seedlings will be a more definitive indication of its ploidy. 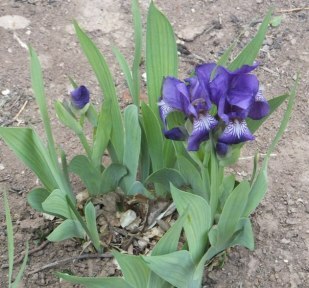 I'm also working with a crop of seedlings, from seed obtained from Josef Juráek in 2011 as "Iris reichenbachii yellow". 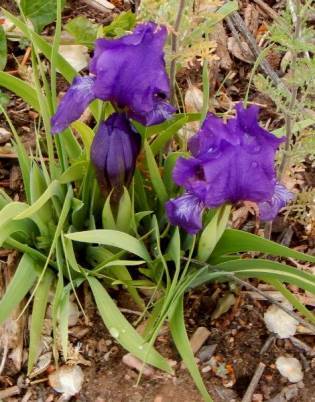 The plants are diminutive, gray-violet, and in some years appear more like I. suaveolens rather than I. reichenbachii. 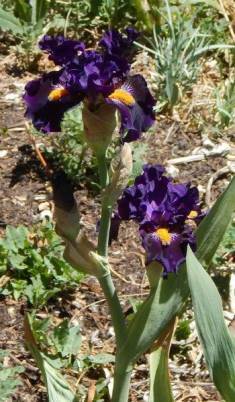 Their pollen readily produces full pods when crossed with tetraploids, but only an occasional seed when crossed with diploid MTBs. 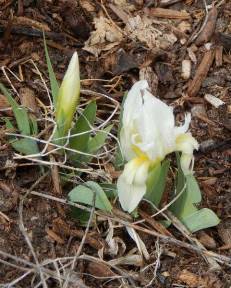 Could these also be tetraploid plants? 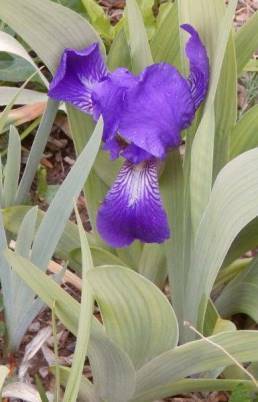 A third Iris reichenbachii, T013-01, from an Archibald seed collection in Kavala, Greece, is tall and elegant. I've only made a few test crosses with it to date, but it also seems compatible with tetraploids. Snow Flurry (Clara Rees, R. 1939). TB. 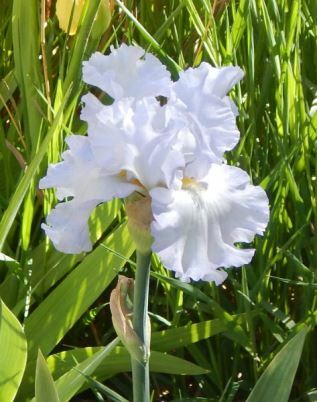 EM, 48", Pure, frilled and ruffled icy white with a faint blue cast; orange blossom fragrance. 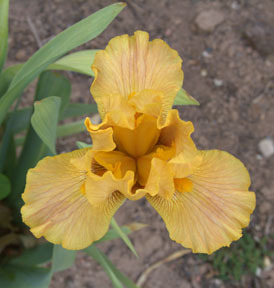 'Purissima' x 'Thais'. AM 1941. 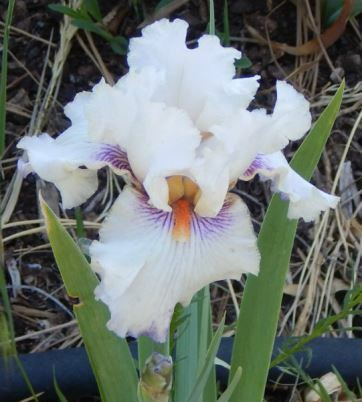 I have chosen 'Snow Flurry' as the poster child for the work of early 20th-century breeders in creating the modern fertile family of tetraploid TBs. 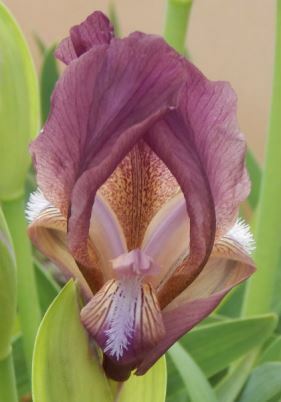 Most irisarians know the story of how Clara B. Rees's cross of the white tetraploid 'Purissima' with the orchid diploid 'Thais' produced a pod with a single viable seed. 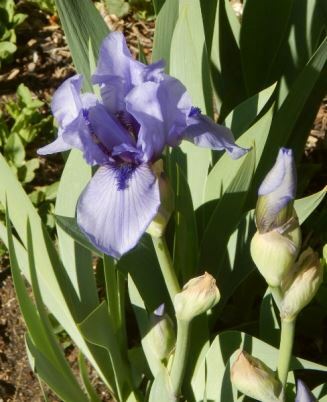 The seedling, 'Snow Flurry', was a breakthrough in form, color, and substance, and appears in the parentage of a great many modern irises, especially whites and blues. 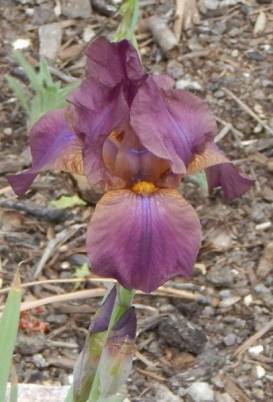 Progenitor (P. Cook, R. 1951) Sdlg. 1346. 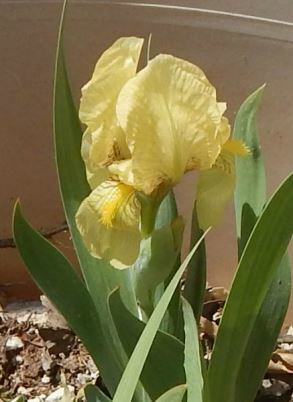 IB, 15" (38 cm), E Light yellow and light violet bicolor. 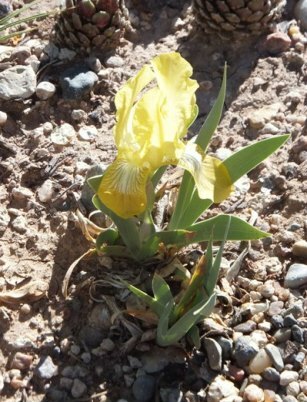 Yellow I. reichenbachii x 'Shining Waters'. 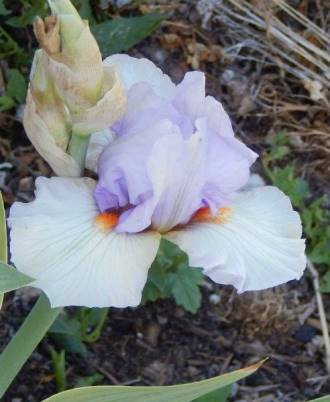 This unspectacular little iris (barely IB height) revolutionized TB iris breeding by introducing the dominant bicolor pattern, as seen in its famous descendants 'Whole Cloth' and 'Melodrama'. This stands as an example of how introducing new species into the gene pool of a fertile family can have far-reaching affects that are not obvious when the initial crosses are made. New Idea (Ben Hager, R. 1970). Seedling MTB2009A . 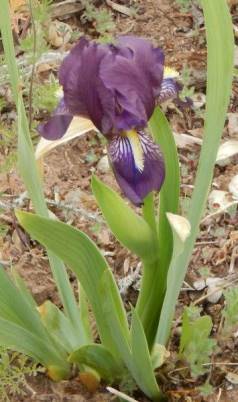 MTB, height 26" (66 cm), Early Mid bloom season. Rosy mulberry self; yellow beard. 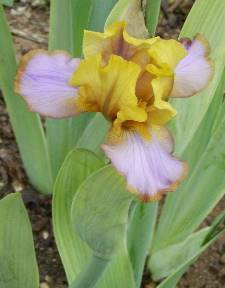 A668A : ('June Bride' x Iris aphylla 'Thisbe') X M1381A : ('Frenchi' x 'Pagoda'). Melrose Gardens 1970. Williamson-White Award 1976. 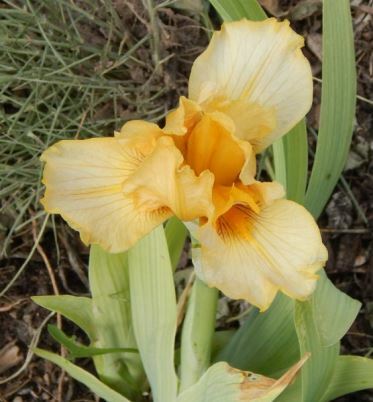 Although 'New Idea' was not the first tetraploid MTB to be introduced from Ben Hager's I. aphylla breeding program, it was the first to receive wide-spread acclaim, receiving the Williamson-White Award in 1976. 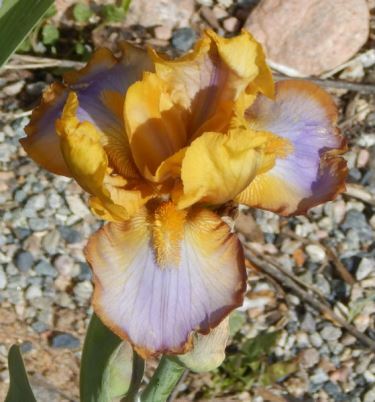 Not only did Hager succeed in producing MTBs that were fertile with TBs and BBs and showed the improved branching bestowed by I. aphylla, he also demonstrated that this unprecedented breeding approach could produce irises that met the highest quality standards of the class. Puppy Love (Ben Hager, R. 1979). Seedling AMT3152Pk . 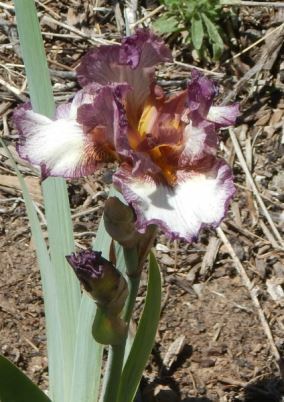 MTB, height 19" (48 cm), Early Mid bloom season. 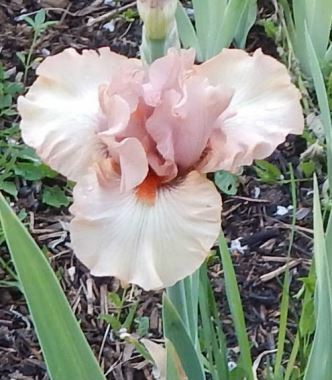 Pink self; pale tangerine beard. 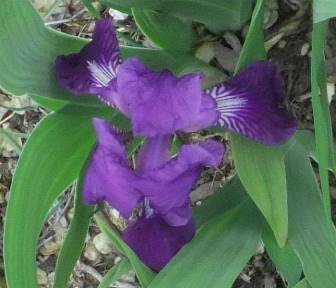 (('New Idea' x (('Norah' x Iris aphylla 'Thisbe') x sibling)) x (((('Norah' x 'Thisbe') x sibling) x ('Frenchi' x 'Pagoda')) x sibling)) X (((('Seventh Heaven' x unknown) x ('Frenchi' x 'Pagoda')) x (('Norah' x 'Thisbe') x sibling)) x (((('Norah' x 'Thisbe') x sibling) x ('Frenchi' x 'Pagoda')) x (('Norah' x 'Thisbe') x sibling))). Melrose Gardens 1980. Another Hager tetraploid MTB, 'Puppy Love' brought the tangerine pink genes into the MTB class. 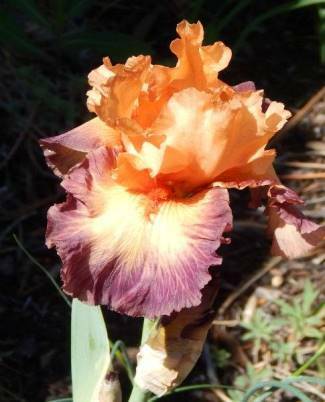 (Traditional MTBs are diploid, and the tangerine factor has never shown itself at the diploid level.) 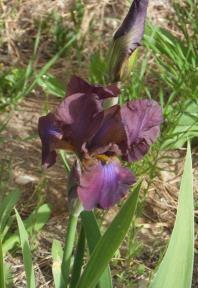 Note the complicated line breeding involved in the parentage. This would only be possible in a fertile family. 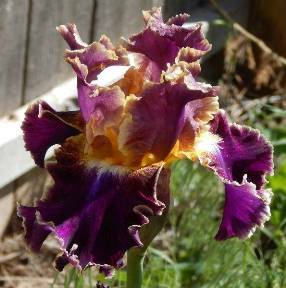 This is thus another fine example of how using the fertile family approach to breeding can dramatically expand the possibilities in a given class of iris. Illustration: 'My Fantasy' (J. 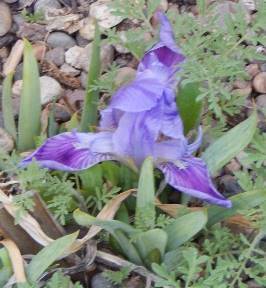 & V. Craig '05) a tetraploid IB from I. aphylla breeding.